Fashionable hairstyles offer a number of new and original solutions to create a spectacular and attractive style and image. From natural and careless hair style to classic hairstyles on smooth hair – be ready to stand out and attract attention. Get ready for new experiments with styles in 2014. Follow the fashion trends proposed by designers and stylists at the shows of 2013. Natural hairstyles will create a romantic image, smooth classic styling is suitable for an office spectacular image. A variety of new hairstyles conquers and gives ideas and inspiration for experiments with styles. We present a selection of some of the most spectacular and attractive hairstyles, which you can easily recreate at home. Natural hairstyles never go out of fashion. For the spring season 2014 stylists offer romantic hairstyles. Hairstyles are determined by some unfinished styling. 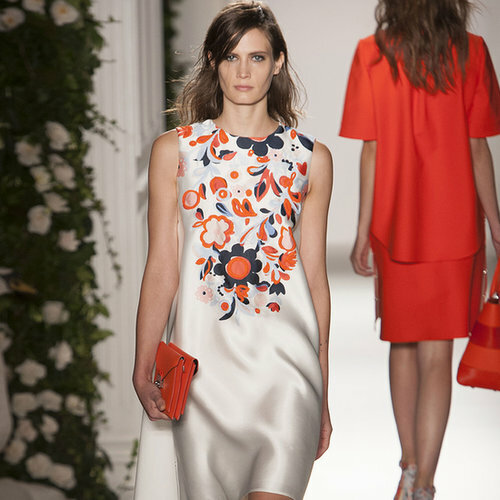 Mulberry presented their spring 2014 collection at London Fashion week. Emma Hill was inspired by British traditions like tea drinking, gardens and even casing dogs. All of the above dominated in hairstyles are presented by Emma Hill. The image of an independent busy woman was presented. What about hairstyles, all of the models were casual like, most of them wore long straight hair but a little bit messy. Other models wore a messy bob with untidy bangs. A particular thing (a common one) in all haircuts is that all of them have messy bangs falling down their right eye. It creates an image of a tired city woman who knows what she wants from life but doesn’t have any time for herself. What about colors, blond, light brown, auburn and dark undertones are represented. If you expect to see shiny healthy hair, you will be disappointed… Can London smog make your hair shiny? Mark Fast represented his spring collection of 2014 at London Fashion Week. He was inspired by fashion of the 1990s. Nine Inch Nails band’s creative work screwed him up as well. The main colors of his collection are bright yellow, black and grey. What can we expect to see in his hairstyles? All the models wear very messy long straight hair. It is difficult to understand what hairstyle is dominant because all the girls have an untidy and a vampire-like look. Black is the only colour present in his models’ hair. So, if you want to be up-to-date, black is in fashion. Marc Jacobs represented his spring collection of 2014. This collection slightly resembles autumn 2011 collection. It has Hawaiian motives and Victorian prints. This collection can hardly be named feminine and womanish… You’d rather call it androgynous. Models wear short shaggy bobs with very short bangs. The haircuts are made in a careless manner as if they were performed by a girl hairdressing her dolls. The bands are very short with ragged edges. Blond color is dominant but you can also see blond with black bangs or with black locks. Ralph Lauren started his collection with black and white dresses and toilets. Neon colors dominated in the middle of the show. The most popular hairstyle in his collection is long straight hair of blond, auburn or chocolate undertone. Long straight bobs are also present for those who don’t get used to wearing very long hair. If you are a fan of short hair, you may wear a short bob with a short bang. Most of his models don’t wear bangs. Elegancy and casualness are the distinctive features of this show. Herve Leger by Max Azria presented their spring collection 2014. The designers were inspired by ethnic motives. These motives found their way in hairstyles. Dark and auburn, long and shoulder-length hair with gelled top hair brushed back from the forehead create an expressive and impressive image. Oscar de la Renta presented his womanish toilets both in black and white undertones and in caramel colors. Karlie Kloss and Joan Smalls made the final appearance. One of the exciting spirits of hairstyles of the new season could be described as a legendary node. It is a perfect daily hairstyle, casual and formal at the same time. Moreover, node is very easy to make yourself at home. Negligence, lightness and sexuality characterize this hairstyle. Pony tails are popular for all colors and color shades. The only point to pay attention to is to have your hair parted strictly in the middle of your head. You may also make your hairstyle a little untidy as if you have been running for a minute. A wonderful collection by Red Valentino is represented in New York. Young ballerinas dreaming of fame and grand stages inspired the designer. Ballet for them is like a beautiful garden full of flowers and butterflies. The image is airy-fairy and weightless. The model has blond soft hair which is put up to the top of the head. The bang is lowered to the forehead a little. A pink band with a bow completes the dreamy image. From unfinished careless styling to ideal, hair to hair hairstyles, spring season offers a lot of ideas and sources of inspiration. As for a quick hairstyle, look at the shows by Mulberry and Mark Fast. Light and quick hairstyles were presented on the show by Oscar de la Renta and Ralph Lauren. If you need classic spectacular hairstyles for evening image, note the ideas of Valentino.